(Nanowerk News) In a world-first achievement, scientists from the RIKEN Center for Emergent Matter Science in Japan, along with colleagues from the National Institute of Material Science and the University of Tokyo, have developed a new hydrogel whose properties are dominated by electrostatic repulsion, rather than attractive interactions ("An anisotropic hydrogel with electrostatic repulsion between cofacially aligned nanosheets"). Cofacially oriented sheets in a 10-T magnetic flux were spatially immobilized with TiNS-mediated photoinduced crosslinking polymerization. According to Yasuhiro Ishida, head of the Emergent Bioinspired Soft Matter Research Team, the work began from a serendipitous discovery, that when titanate nano-sheets are suspended in an aqueous colloidal dispersion, they align themselves face-to-face in a plane when subjected to a strong magnetic field. The field maximizes the electrostatic repulsion between them and entices them into a quasi-crystalline structure. They naturally orient themselves face to face, separated by the electrostatic forces between them. 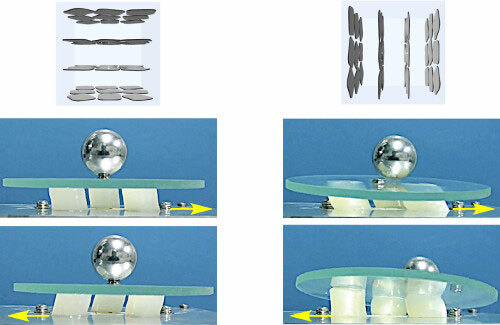 On a mechanical oscillator, a glass stage featuring a metal sphere on a tee was supported by three cylindrical pillars of magnetically structured hydrogel containing cofacially oriented TiNSs (0.8 wt%) in parallel (g) or orthogonal (h) direction to the cylinder cross-section.